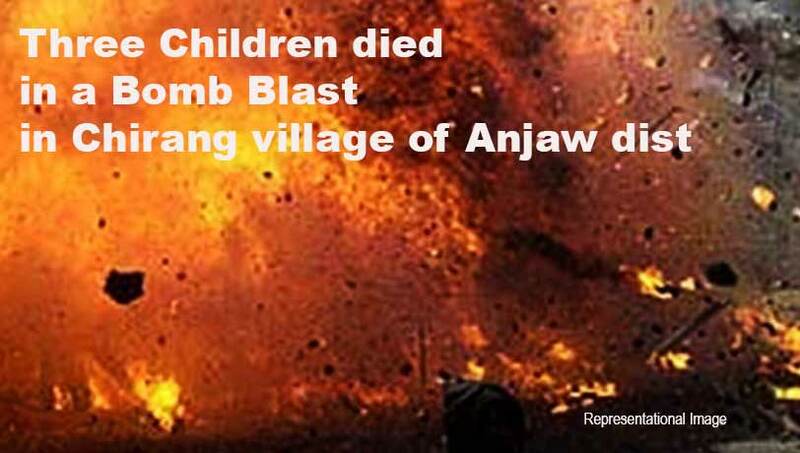 In an unfortunate incident of Bomb Blast on Saturday evening, three children lost their lives in Chirang village of Anjaw district of Arunachal Pradesh. According to the local sources, children are believed to have found a live bomb from the army firing range near their village which later exploded and the three children died. The Local MLA Dasanglu Pul, share this information through social media. She wrote in her fb time line ” A news of an unfortunate incident coming in from my constituency where we lost three children in a bomb blast which occurred this evening at Chirang village under Hayuliang circle. Children are believed to have found the live bomb from the army firing range near their village and collected it without knowing the dangers out of it and it exploded this evening. My heartfelt condolences to the bereaved families. In this testing time, whole Anjaw stands with the bereaved families”. Dy CM Chowna Mein also shocked after hearing this news. He Tweeted ” words are not enough to console the grieving families. Actually, before firing or training, Army authorities always issue an alert to the local people. However, sometimes during the exercises , some artillery shells remained unexplored and such type unfortunate events occur.